Viola Davis, LeBron James, and Matt Damon, to name a few, were all on the list along with their addresses. 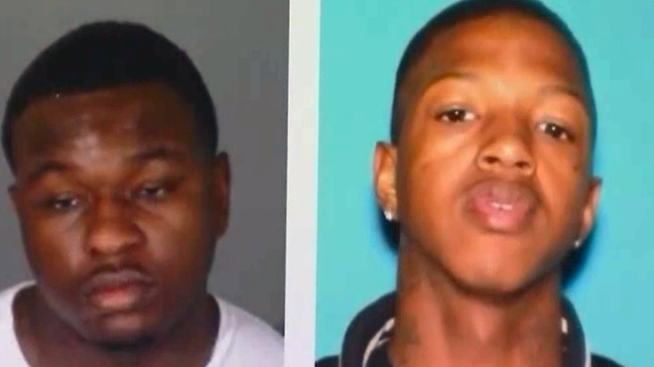 Tyress Lavon Williams, 19 (pictured left), Damaji Corey Hall, 18 (pictured right), Jshawne Lamon, 19, and Hall’s mother, Ashle Hall, 34, were arrested in connection with the burglaries, LAPD said Tuesday, Oct. 2, 2018. As detectives made arrests in connection with recent burglaries at the homes of Los Angeles celebrities, a list of celebrities and athletes - plus their addresses - was discovered amid stolen purses, cash, firearms and more, police said Tuesday. A small specialized group of gang members with a "bling ring" type of scheme were accused of burgling several Tinseltown celebrities' homes, Capt. Lillian Carranza, commanding officer of the Los Angeles Police Department's Commercial Crimes Division, confirmed at a news conference on Tuesday. While at first police believed the suspected thieves were targeting homes at random, they discovered that the crew was actually reviewing social media posts, touring and travel schedules to determine the best time to hit the home. The group would allegedly dress in button-down shirts and dress clothes, riding in luxury cars, to enter the neighborhoods where the rich and famous reside in order to scout potential homes, Carranza said. Once they crew determined which home to target, a larger car or truck would roll up with a change of inconspicuous clothes, and be available to cart away the stolen goods, Carranza said. After knocking on the door to find no one home, the suspects were accused of breaking in through a window before they headed straight to the master bedroom. There they would allegedly steal firearms, cash, watches, jewelry, and other valuables they could carry, before they were out the door in minutes -- before security could notify authorities. Just last week, one such burglary was reported at the home of Los Angeles Rams wide receiver Robert Woods, whose Woodland Hills home was burglarized Thursday just as Woods finished playing against the Minnesota Vikings at the Los Angeles Coliseum. Three suspects were accused of burgling Woods' home after they were stopped for an unrelated incident in the South Los Angeles area, Carranza said. After finding a firearm and other stolen items in the car, Carranza said they were detained and ultimately arrested. Tyress Lavon Williams, 19, Damaji Corey Hall, 18, Jshawne Lamon, 19, and Hall’s mother, Ashle Hall, 34, were arrested. Hall's mother was arrested while police served two search warrants at their home, where police say more than $50,000 in cash and designer purses were discovered, among other items. A list of celebrity and athletes' names, including Viola Davis, LeBron James, and Matt Damon to name a few, were discovered with their addresses. Also last week, a possible burglary was investigated at the home of nine-time Grammy-winning singer Rihanna. In the Woods case, the three suspects allegedly entered the home in the 7800 block of Hillside Avenue by breaking a glass door in the back of the home before taking unspecified property, while in the Rihanna case, officers responded to a home in the 7800 block of Hillside Avenue about 9:30 p.m. Tuesday, according to the LAPD. An alarm was sounding and lights were flashing at the home, but no one was inside at the time, police said. Police said they believe the four arrested suspects are responsible for other burglaries and they displayed recovered items in the hope that victims will recognize their property. In May, a Fullerton man was arrested after an assistant for Rihanna found him inside the singer's home at the same address. Police alleged Eduardo Leon, 26, broke into Rihanna's house and spent 12 hours inside. Leon was charged with stalking, first-degree residential burglary and vandalism. Celebrities including Alanis Morissette, Nicki Minaj, Emmy Rossum, Jaime Pressly, David Spade, Christina Milian, Yasiel Puig, Derek Fisher and Byron Scott have all been victims in burglaries or attempted burglaries in the Hollywood or Beverly Hills area over the last couple of years.